As the temperatures heat up across the country, everyone’s heading straight to the pool. If you’re looking to add a bit more style to your backyard living environment, then consider incorporating any one of these stunning water feature trends into your Houston swimming pool and spa area. Ever dreamed of having your very own television right in your backyard? 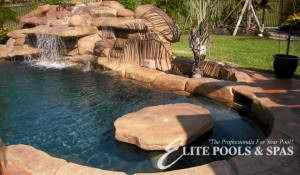 Then consider adding a water screen to your pool area. Water screens allow pool lovers to view their favourite movies and television shows from the pool or terrace, and can be completely customized to suit the style of your pool or patio area. If you’re looking to add some nature-inspired features to your pool, then look no further than constructing faux rock grottos with overflowing waterfalls. Not only are these a beautiful addition to any pool, but the rock grottos can also provide additional seating for bathers. Pair this up with a variable speed pump that can easily change water flow levels to give your pool a unique and natural appeal. A hot new feature to hit backyards and patio area is the “spill over table”. These glass tables can be installed close to the edge of the pool, and one or both ends of the pool feature water which then spills over the edge, creating a table top waterfall effect. Add some creative lighting, and you have a wonderful place to dine at dusk.